OUR BEST SALE EVER ! 3 CANS OF SAMPLE SIZE SNOW-JET PER ORDER. LEFT OVER FROM TRADE SHOW SO THERE IS LIMITED QUANTITY LEFT AND THEY GOTTA GO! ORDER TODAY TO GET IN ON THIS REAL DEAL ! Snow-Jet is specially formulated to solve the age old problem of snow sticking to snowblowers, shovels, plows and other snow equipment. Snow-Jet is easy to apply -- just shake and spray! 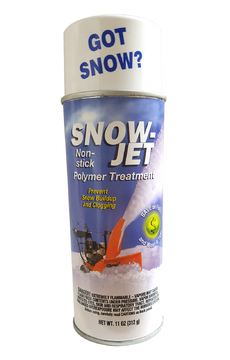 Snow-Jet is a polymer spray that builds up over time, the more you use it the better it gets. You'll work less and your snow equipment will run more efficiently. Works Great on Metal and Plastic Chutes ! Approved by the leading Snowblower Manufacturer in the World! Copyright MDI PRODUCTS,LLC. All Rights Reserved. by 3dcart Web Store Creator.